Rubber Room Ramblings: RAZZLE DAZZLE WITH RASPBERRY LEMONADE! This is a swap that Evelyn Osinski traded with me in Ohio. 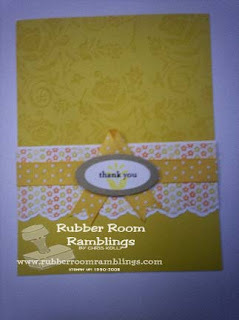 She used the Razzle Dazzle stamp set with some Raspberry Lemonade Designer Series Paper. She made these in colors to match all of the new Stampin' Up! In Colors, and they were all so beautiful!